Olybet, previously known as "Olympic Online", was founded in 2010. This online poker room belongs to the company "Olympic Casino Eesti AS". 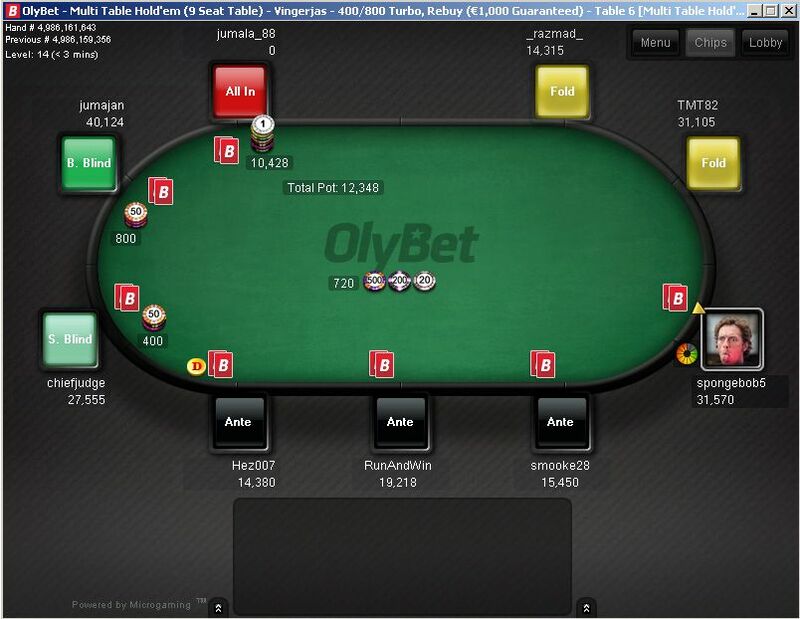 A few years ago, Olybet moved from the iPoker network to the Microgaming network. Due to that, today on Olybet you can find a lot of various tournaments, cash games, sit-n-gos, "Fish Party" and "Blaze Poker". The best news is that PokerNews visitors have a unique opportunity to get more bonuses and try casino games for free! Every new player who registers for an OlyBet account via PokerNews will receive a 100% first deposit bonus up to 500 Euros. That means your first deposit will be doubled! Your bonus will be paid out in increments from 1 to 10 Euro. In addition, all new players are invited to participate in 12 exclusive freerolls with a great prizes on top! You can find them in tournament lobby named "New Player Freeroll". They start every Wednesday evening with guaranteed prize pools — €888 and €1,000. Not many rooms organize as many freerolls as OlyBet. Every month, OlyBet pays about €40,000 in freerolls which take place every few hours. The most valued OlyBet freeroll is the "Sunday Freeroll" with a €3,000 guaranteed prize pool! If you want to participate in it, you only need to play 100 raked hands in cash games per week. Another big freeroll is the "Saturday Freeroll" with a €1,000 guaranteed prize pool. Players are eligible for this tournament if they played 25 raked hands during the last 24 hours. Daily freerolls have prize pools ranging from €25 to €50. Every Monday evening, OlyBet organizes an exclusive tournament called "Flush Royale". 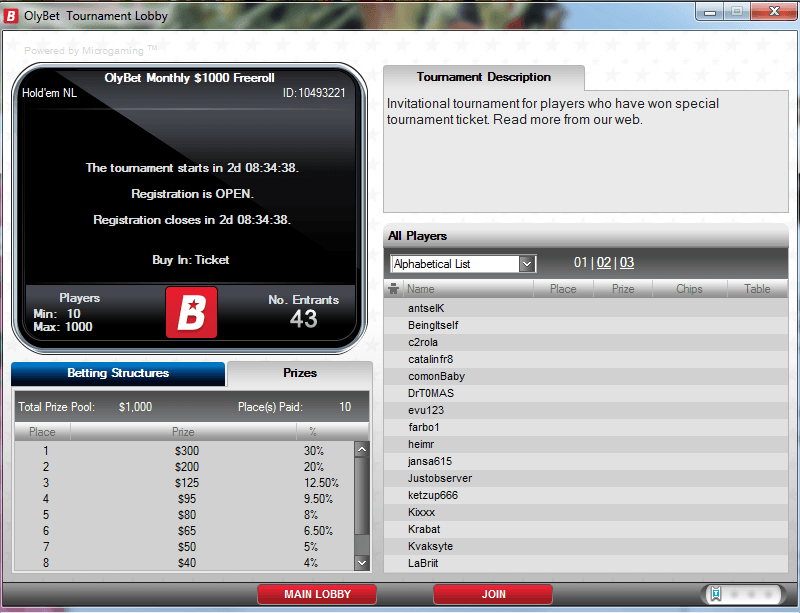 This tournament with only a €3 buy in has a guaranteed prize pool of €500 plus a special prize. Any player who hits "Royal Flush" combo will receive a €1,500 package to the "Microgaming Poker Network" live poker festival. Hit the bad beat jackpot and become rich! Join OlyBet's exclusive tables with a "Jackpot" mark and if you lose with 4 of a Kind or better, the Jackpot is yours. 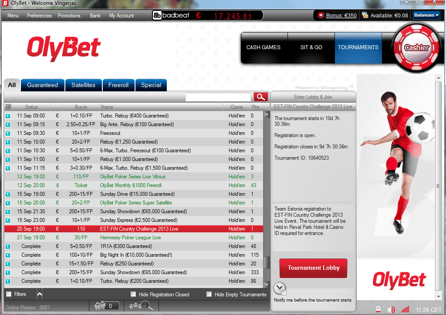 Travel in Europe and play in prestigious live poker tournaments for free with OlyBet. The next "Microgaming Poker Network" stop is in Manchester. The buy-in for the Main Event is 550 pounds and you can win a share of the £150,000 guaranteed prize pool. You can qualify for this tournament on OlyBet every day. All live tournament package winners will receive ticket to the Main Event, a £110 ticket to the side event, a hotel room at "Park Inn by Radisson", an invitation to the VIP party, and also €200 for travel expenses. The biggest gambling company in Estonia, "Olympic Casino Eesti AS" was founded in February 2010. Today OlyBet provides all gambling services - sports betting, casino, poker and more. You can register for OlyBet's poker room if you are older than 21, while sports betting is allowed at 18 and older. It's very easy to become VIP club member - just play real money poker. Every time you play poker, you earn loyalty points. The more points you earn, the more privileges you get. How to earn loyalty points? For every one raked Euro you receive 30 points which are multiplied depending on your VIP level. Players who reach Platinum VIP level receive 30% rakeback. The exchange rate is €0.75 in cash for every 100 points. The rest of points you can use for tournament buy ins.